Dr. Atom and his dog have got the cure for this puzzling disease. Help them wipe it out! Step into a world where almost everything is made entirely out of candy! But it’s a bit unorganized, though. Can you link together all of the mixed up sweets in this match 3 puzzle game? If you get stuck, you can always break out a powerful booster that will help clear things up. Matchmaker make me a match! 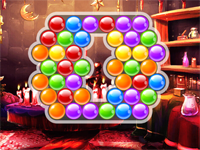 Play this fun and free match 3 game to unlock mysteries and powers by matching 3 or more of the same colored balls. It’s up to this enchanted totem to prevent all of these mystical orbs from destroying his temple. Can you help him link them together and make them vanish in this exciting match 3 puzzle game? You can also collect precious coins during his adventure. Mahjong gets a whole new spin in this online version of the classic board game. Instead of tiles, can you match up all of the playing cards? You’ll need to race against the clock in order to beat each one of these difficult boards. Dive into this undersea lagoon and find out if you can eliminate all of the tiles. Celebrate the season with this magical puzzle game. How quickly can you match up all of this candy? You can enjoy a majestic view of a gorgeous alpine lake while you match up the cards in this relaxing online version of the classic game. Match up the cards in the outer pile with the corresponding ones in the foundation piles below.